Temperate climates in North Carolina provide a long growing season for tomatoes that typically grow in all areas of the state from June through November, report horticulturists at the North Carolina State University Extension Center. Soil and climate conditions vary widely, however all areas enjoy the same long growing season. There are a number of varieties of tomato plants that do well in the different regions of North Carolina. Better Boy tomatoes grow well in rugged mountain areas where vines must be tied to a variety of inclines. The vines on Better Boy tomatoes are rugged and sturdy. They produce a 12-to-16 oz. fruit and are disease resistant. 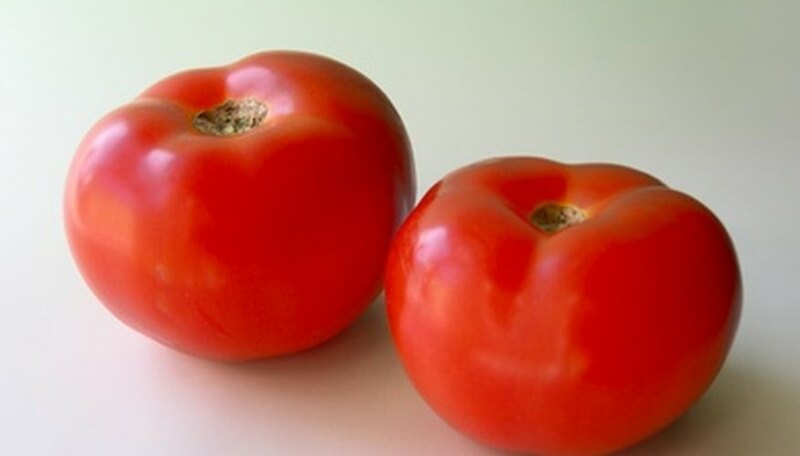 They make a round, firm tomato that is ideal for slicing and making into tomato sandwiches. They are best picked in mid-season. Big Boy tomatoes are not quite as disease resistant as the Better Boy, but the the Big Boy is a favorite in North Carolina because it produces such large tomatoes, often heavier than 1 lb. and are very flavorful. Big Boy tomatoes often can be picked well after the first frost. Mountain Pride tomatoes grow well in the central parts of the state, called the Piedmont, as well as the coastal plains and the mountains. Mountain Pride produces large tomatoes in the mid to late part of the growing season. The large tomatoes are crack resistant, which make them good candidates for shipping. Mountain Pride tomatoes were developed by the North Carolina extension center and are disease resistant to the bugs in the state. Piedmont tomatoes also do well in all North Carolina regions and produce large, smooth, firm fruit. Celebrity tomatoes are one of the most flavorful varieties. They grow well in all areas of the state. The 8-to-12 oz. tomatoes grow on hearty vines that work well on mountain slopes or flatland stakes. The Celebrity is an heirloom tomato that continues to flower and grow more fruit after the first batch has been picked. The most flavorful tomatoes, like the Celebrity and other North Carolina grown tomatoes, are those that produce abundant foliage over and over.